Here are a few of our most Frequently Ask Questions, if we missed anything out, please feel free to get in touch! What’s included when I book your band for my wedding? · Two x one hour completely live sets or three x 40 minutes. · First dance / father-daughter dance request from our repertoire -as long as it is “band friendly”, -if not, we will be more than willing to play the original track through our state of art PA system for you. · High quality, energetic performances of music from leading acts from the sixties to present day depending on the audience, respectfully. · Music right up until midnight, regardless of when the band perform their last set. Feel free to put a playlist together on a media player such as an ipod, ipad, tablet or mp3 player. · 4k Professional active PA system, which includes 2 x Yamaha DSR 18in subs, 2 x Yamaha DSR 15in tops with High Frequency drivers and includes 4 x HK professional stage monitors with professional lighting system for band and dance floor. · Performance times between 8pm and midnight. · Full entertainment contract for your confidence peace of mind. · Full public liability insurance up to ten million pounds sterling and all equipment is pat tested. When you are ready to book The Vertigo Band, we will send you a contract to be read and signed and returned either by post, email or fax together with a confirmation letter and the date will be held for you for a period of 7 days. Once you have made a decision and wish to proceed with the booking, a deposit of £250 to secure the booking will be required, payable by bank transfer, cash or cheque. The remaining balance is payable 14 days prior to the event date, again by bank transfer, cash or cheque, unless an alternative agreement has been made which is satisfactory with both parties. Do I need to book a DJ as well? Included in our quote is music from 8pm right up until midnight. We travel with lots of tracks on various devices, such as laptops, tablets and mp3 players and we have some great party playlists we have put together suitable for all occasions, but you can create your own party playlist on CD or iPod for the night which we’ll be happy to play through our PA system. Most clients find that a DJ is not required when booking The Vertigo Band, but if you want one, we work with some great DJ’s across the Midlands who we can highly recommend, who can share our PA system if necessary. All over the UK, but mainly within the Midlands as from experience the price to you will remain competitive. We’re based in Shrewsbury, Shropshire but regularly travel up and down the M6, M5, M54 and throughout Mid Wales. If you want us to dance around then a stage/performance area of 12′ x 12′ is ideal, but we’ve squeezed into some impossibly tight spaces over the years and still every occasion has been a blast and a huge success. Get in touch if you’re unsure, One of us will be able to help you make a decision. Setting up the full band with lights and PA will take around 45 minutes to an hour, depending on the distance from our vehicles and if there are stairs to contend with and as long as we have clear access to the room. Should you require the band to be set up before your guests arrive we are able to accommodate this for a small additional fee, to be negotiated. This covers for our time, as you will appreciate. We don’t always need to sound check like a lot of bands, but it’s always beneficial as all venues are different, but all our equipment is state of art and digital and we’ve got everything realistically pre-set ready to rock the party from the first note! We do ask for 5 bottles of still water, but that’s all. You’re more than welcome to provide food for the band during the evening, it is very much appreciated but not a strict requirement. Most of our events are private functions but, when possible, we will try and hold a public showcase once or twice a year which we would love you to attend. What happens if a band member cannot perform due to illness? We’ve got it covered! Whilst The Vertigo Band is made up of a core of musicians, we have a number of rehearsed “Deps” who can stand in at short notice. We’ve been performing since 2009 as The Vertigo Band and have never been in a situation to let anyone or any occasion down. OK, I’m ready to book! What now? That’s great! If you haven’t already checked if we’re available, you might want to do that first. Please email thevertigobandlive@gmail.com or complete the get a quote form and we’ll get straight back to you. 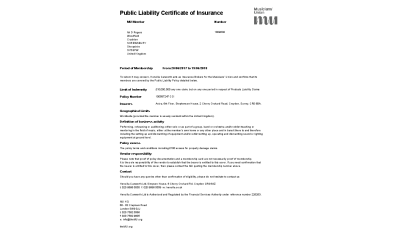 Please see copy of our Public liability insurance below.